Corner hutches are wonderful space-savers for the dining room or kitchen if you need extra storage. 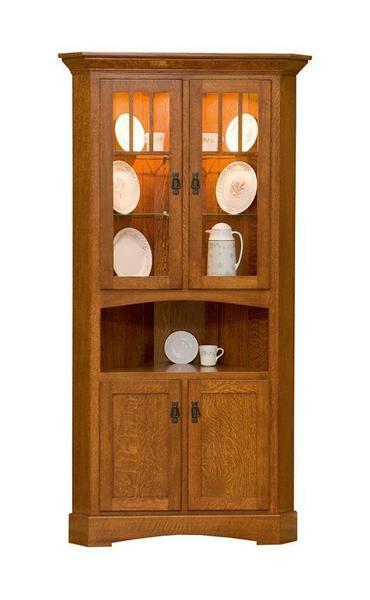 Showcase your best crystal and family china inside the hutch top with glass doors. This china hutch is handcrafted just for you in your choice of wood and finish by an Old Order Amish woodworker in America. This corner hutch is made in a Mission style but by choosing different hardware you can transform the look. Standard features of this corner hutch include a tongue and groove hutch top back, glass shelves and touch lighting. Call today to speak to an Amish Mission furniture specialist at 1-866-272-6773 or stop by our furniture store in Sarasota, Florida.